Employers use telephone interviews as a way of identifying and recruiting candidates for employment. Phone interviews are often used to screen candidates in order to narrow the pool of applicants who will be invited for in-person interviews. They are also used as a way to minimize the expenses involved in interviewing out-of-town candidates. For remote positions, a phone interview may be the only one you have. Before you get on the telephone to interview for a job, review these phone interview tips and techniques so you can ace the interview and make it to the next round. Prepare for a phone interview just as you would for a regular in-person interview. Compile a list of your strengths and weaknesses, as well as a list of answers to typical phone interview questions. In addition, have a list of questions ready to ask the interviewer. If you have advance notice of the interview, make sure to review the job description and do a bit of research on the company. Take the time to match your qualifications to the job description, so you can speak to why you’re a strong candidate for the position. Review your resume, as well. Know when you held each job, and what your responsibilities were. You should feel comfortable and ready to discuss your background and skills confidently during a phone conversation. Talking on the phone isn’t as easy as it seems. As with an in-person interview, practice can be helpful. Not only will this help you rehearse answers to common phone interview questions, but it will also help you realize if you have a lot of verbal ticks, fail to enunciate, or speak either too fast or too slow. For practice, have a friend or family member conduct a mock interview and record it so you can see how you sound over the phone. Once you have a recording, you’ll be able to hear your “ums” and “uhs” and “okays” and then practice reducing them from your conversational speech. Listening to the recording will also help you pinpoint answers that you can improve. Use a quiet, comfortable, and private space with no distractions so you can focus on the interview. Do speak slowly and enunciate clearly. Do take notes when possible on what questions came up. 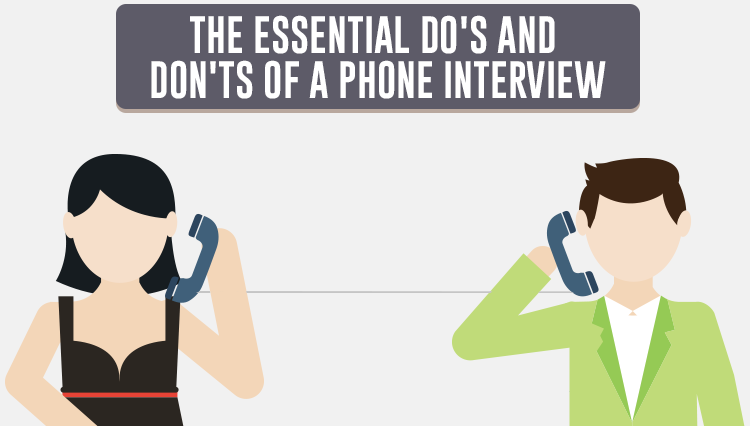 Review more phone interview do’s and don’ts to prepare. Review these guidelines for appropriate phone interview etiquette, so you make the best impression on your interviewer. Answer the phone yourself, let family members and/or roommates know you are expecting a call. When you answer the phone, answer with your name i.e. Jane Doe (in a perky tone of voice), so the interviewer knows they have reached the right person. Use the interviewer’s title during the conversation (Mr. or Ms. and their last name.). Only use a first name if they ask you to. Otherwise, use the formal title. Listen carefully to the interviewer and don’t start speaking until the interviewer finishes the question. If you have something you want to say, jot it down on your notepad and mention it when it’s your turn to talk. Don’t worry if you need a few seconds to think of a response, but don’t leave too much dead air. If you need the interviewer to repeat the question, ask. As the interview winds down, make sure to say thank you to the interviewer. Once the interview is over, carefully review any notes you were able to take during the conversation. Jot down what types of questions you were asked, how you responded, and any follow-up questions you may have if you have an opportunity for an in-person interview. Follow up soon after the call with a thank you note that reiterates your interest in the job. Use a land line. Unless your cell phone service is 100% all the time, use a land line instead of a cell phone. That way you won’t have to worry about dropped calls and getting disconnected. Review these questions to ask the interviewer and have a few ready in advance.